This article uses technical jargon and is intended for IT professionals. The In-Place Archive is a free 50GB of additional storage, doubling each users’ mailbox size from 50GB to 100GB. It’s already included in your license. Go to the Exchange Admin Center (EAC) > Recipients > Mailboxes. Highlight your users. In the right menu, click Enable Archive. The new archive should appear in Outlook Web Access almost immediately. The desktop version of Outlook needs to be restarted. If it doesn’t appear after 24 hours, remove and re-add their account to the desktop version of Outlook. 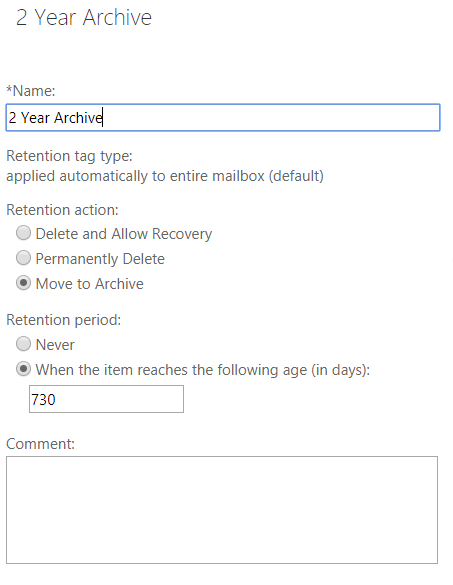 In order to utilize the In-Place Archive, configure at least one retention policy. To do this, first create the necessary Retention Tags. Go to EAC > Compliance Management > Retention Tags. Create tags that match your needs. In the tag above, after 730 days, emails are moved to the archive. Go to EAC > Compliance Management > Retention Policies. Create your retention policy using the tag you just created. Back to EAC > Recipients > Mailboxes. Highlight all of the users who will use the new retention policy. In the right menu, scroll down and click Update Retention Policy. Select your new retention policy, e.g. 2 Year Archive. The change will eventually go into effect. Microsoft uses fuzzy time when it comes to actually applying these changes. 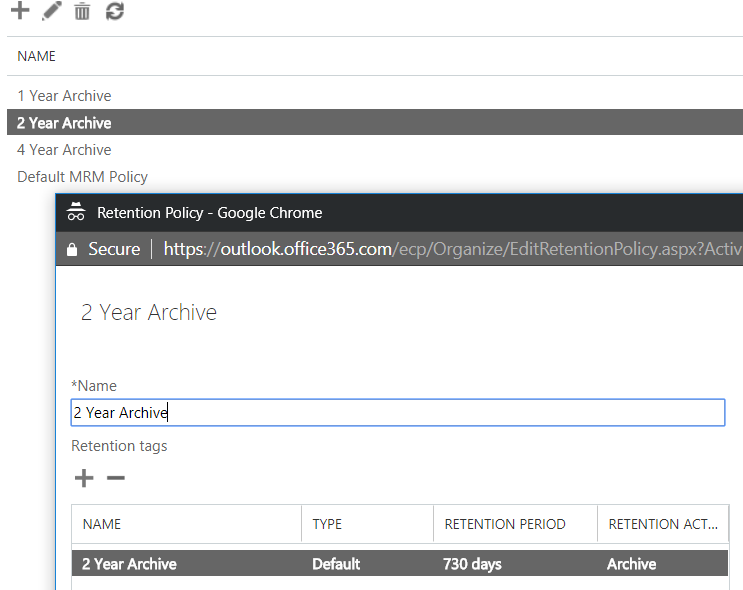 When I deploy Office 365, I proactively configure In-Place Archiving and Retention Policies. That’s because the archive process is slow. The recipient’s mailbox is full and can’t accept messages now. If you find yourself reacting to an emergency like this, you can mitigate the issue by manually initiating the archive process. Please only force a retention policy on one mailbox at a time. Microsoft claims that running subsequent mailboxes will queue them, but from experience, it just seems to just make everything extremely slow. Open a powershell window. Paste the following code. This will connect your local powershell to Hosted Exchange. When the credential prompt appears, type in your administrator email address and corresponding Office 365 password. You can monitor progress by running these commands. Their mailbox should become smaller over time while their archive should become larger. Replace ceo@contoso.com with the primary email of your affected user. Side remark — It would be nice if powershell had the watch command. If you want to see statistics for the entire organization, just pipe Get-Mailbox. Go to Microsoft 365 admin center > Users > Active Users. Click on a user and edit their product licenses. Toward the bottom, find Exchange Online. Provision a secondary license for this user, such as Exchange Online Archiving. User mailboxes are automatically boosted to 100GB capacity. Archive mailboxes are automatically boosted to 100GB capacity. To turn on the Auto Expanding Archive for every user, connect to Hosted Exchange through powershell. It will only affect users with Plan 2. If you are in jam, you can give an additional 10GB of storage to a user’s In-Place archive immediately by redundantly enabling their Auto Expanding Archive. For a more thorough explanation, I recommend reading these excerpts from the official documentation. Microsoft Hosted Exchange absolutely supports unlimited email storage, albeit behind a steep learning curve. Microsoft does little to advertise or promote this feature for obvious reasons. As always, I’ll do my best to answer any questions in the comments below. Know a simpler, faster, or better way to do any of these steps? Leave a comment, I want to learn from you!